Ken Eustace Landscaping has a proven record of creative and excellence in quality landscape design. Our fabulous designs have been installed with the community and many of them are available for viewing in the gallery pages. Our design approach follows a model that not only provides a quality landscape product but also in a most cost effective manner. Ken will personally work with you from the initial meeting right through until the project is complete. You will receive a personalised service that places customer satisfaction as a premier objective. 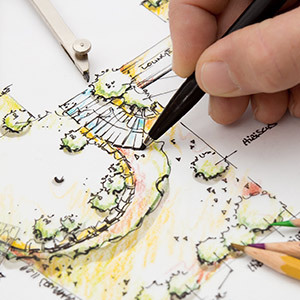 Ken Eustace Landscaping offers many different forms of landscape design. In the context of landscape construction an understanding of different terms might prove valuable when considering landscape design. Landscape construction or Hardscape as it is sometimes referred to relates to everything that does not grow or involve planting. With some minor exception none of this will change with the passing of time. Softscape refers to trees, soil, flowerbeds, vegetable gardens, grass and shrubs. Quality landscape design and construction can refine an outdoor area in the same way as quality planting beautifies an outdoor space. Both are meant to compliment one another and not overpower. When successful landscape design and plant implementation is achieved a high of continuity is achieved between the garden and house in that one flows into the other. Outdoor rooms are created through the use of a combination of different media such as stone, water, steel, plants and feature structures. It is through the successful integration of these different elements that enable us to create unique outdoor spaces. As soon as a Client makes contact with Ken Eustace Landscaping regarding their landscape project we will ask them to fill out our Client Questionnaire which will help us come to our first consultation meeting prepared with relevant information specific to their future landscape. 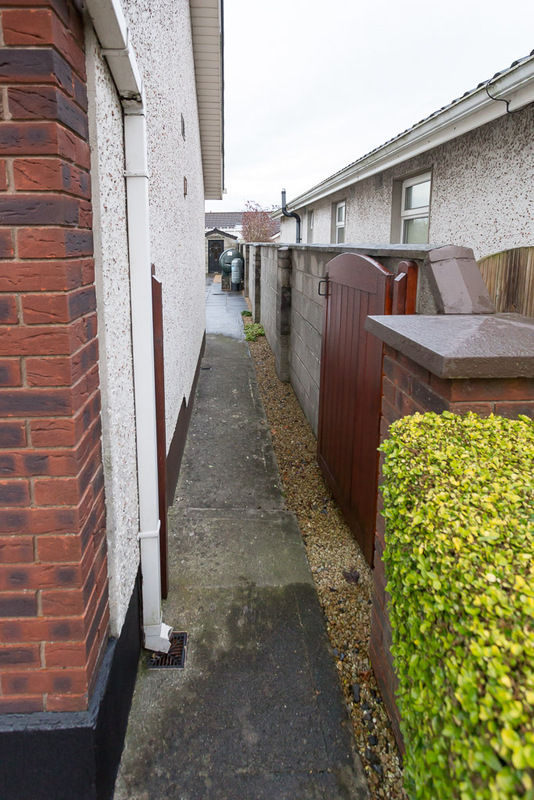 The house had a concrete drive which had been installed by the developer when the house was constructed. The client wished to have the front area paved to reduce maintenance. The side entrance that leads to the back had a series of steps present, we planned to remove these and level the access area. 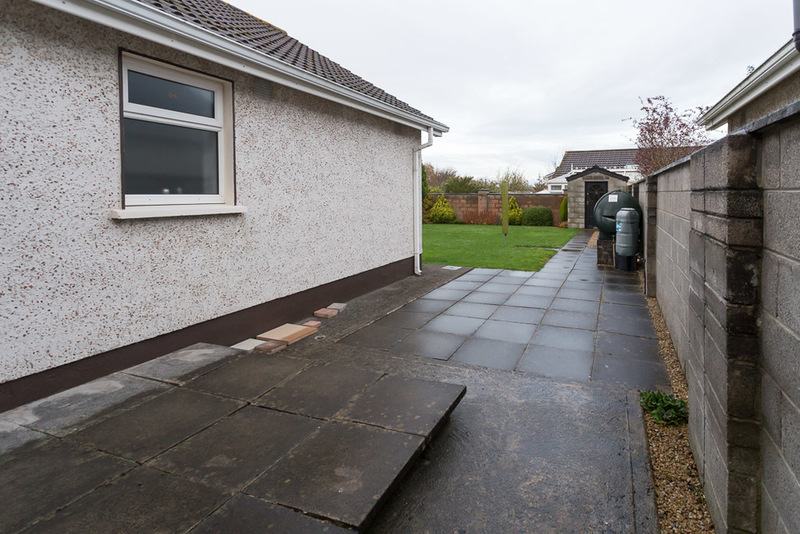 The raised rear patio area was to be removed and the step taken away. 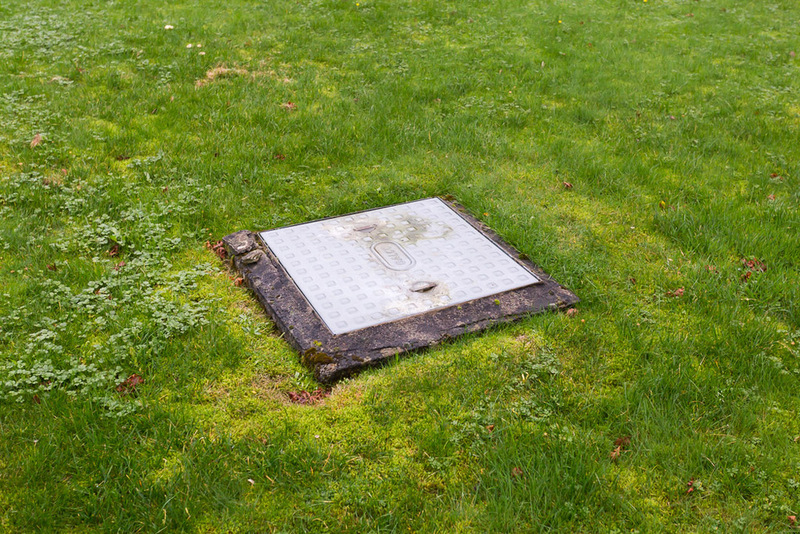 The manhole cover on the lawn was unsightly, I suggested a manhole installation that would remain hidden yet still be fully functional if access was ever required. Oil tanks while a necessity are often unsightly. A robust utility area was to be constructed to conceal and hide the tank and refuse bins. Within two weeks, We return to the client with some draft sketches that meet the design brief agreed upon. At this stage the client may suggest some changes to the draft design. Following this we produce a 3D design realisation that provides a walk through for the client. This allows the client to view the design from different angles and provides a realistic view of how the completed project will look.We will also provide samples of suggested materials for the client which will help them make an informed decision on final choices. Once a final design has been agreed upon a starting date is established and materials ordered for commencement of the project.